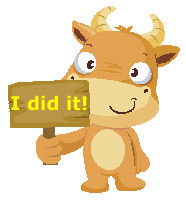 January is over and the score is 31 daily cows! I have to admit that maintaining a daily blog to document cow sightings has been quite challenging so far. It’s not hard to spot cows – I get to spot many more than I end up documenting, and I just highlight the most interesting ones – but it does take discipline to sit down every day and write about it. Especially when I have another personal blog that I’ve been neglecting even though I have tons of post updates ready in my head, a French shopping website to update several times a week, and a freelance business to run. So today is my first milestone. January is over and I documented daily cow sightings for all 31 days of the month. 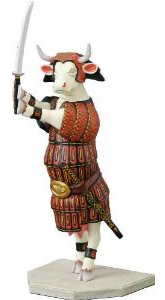 I hope you’re enjoying the daily cow apparitions, some of which are quite expected while others may be more surprising, and stick around for more. Remember you can subscribe to receive this blog’s daily updates by email or RSS feed (instructions are at the top of the column on the right hand side), or follow “Every day I see a cow” on Facebook. So far, I’ve seen a cow every day, and I’m getting to accept the fact that the daily cow sighting theory may be true. 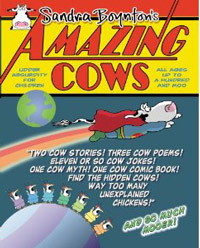 Next Post Sandra Boynton is a fan of amazing cows in her new book! all the cows were so cute!!!! You’re right, I have yet to find an ugly cow, but I think it’s only a matter of time!